Businesses in the Settle area have come together to help local teenage tennis protégé Tom Horsfall take his game to a higher level. 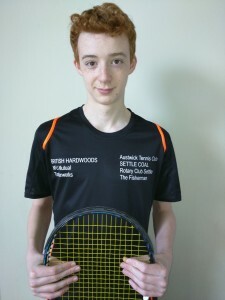 Fifteen year old Tom, who is a student at Settle College, started playing tennis at Austwick aged eight. Under the guidance of club coach Pam Whitehead he has progressed through the club teams and now plays regularly for the A team in the Wharfedale League. Last year he was the Bradford Parks Under 15 Player of the Year and in October was runner up in the Liverpool Winter Tennis Tournament. Tom now has group coaching twice a week at Ilkley and occasional one-to-one coaching from the Ilkley Club performance coach. He has also started to compete in local Lawn Tennis Association events and is rising up the LTA rankings. But if he is to achieve his goal of playing at county and even national level he needs more regular coaching and will have to take part in national competitions. All of which costs money. And that is where local businesses have stepped in to help. Fellow members of the Austwick Club have helped persuade five local businesses to back Tom and, with support from the club itself and the local Rotary, he now looks set to take the next steps towards fulfilling that early on court promise. In return Tom will be wearing the companies’ logos on his tennis shirt and he has even promised to provide tickets to Wimbledon, should he ever manage to qualify for tennis’ top tournament.